ISO-9001 & ISO-13485 certified with facilities in Aliso Viejo & Fremont, CA. 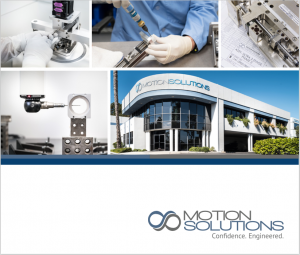 Motion Solutions provides custom, application-specific engineered systems to OEMs and industrial customers in the medical, life sciences, semiconductor, robotics, and industrial automation sectors. We provide a complete selection of services, including electro-mechanical design, prototype and volume manufacturing, and engineering services. With over 60 years of industry experience, Motion Solutions is also a leading distributor of world-class linear motion and motion-control products. As a result of deep relationships with our portfolio of marquee partners, we offer an extensive array of components, from simple hardware to cutting-edge technology. Our experience with the products we sell and history with the factory engineers enable us to match parts to applications and modify to suit. At the same time, our distributorship also gives our engineered solutions group ready access to familiar components at a substantial discount. Our offerings go beyond the pages of a proposal, however. We engage with our customers right from the start to understand how we can meet their needs and exceed their expectations. With a team of 20+ degreed engineers and an experienced manufacturing staff, we are equipped to become an extension of our customers’ engineering departments. Our goal is to be a partner, not just a vendor. Motion Solutions is headquartered in Aliso Viejo, California with ISO-13485 certification; we maintain an additional facility in Fremont, CA. We partner with innovators to push the limits of motion technology to make the world a better place. To be one of the top five providers of custom engineered solutions in the United States. With more than 20 degreed engineers in-house, a highly skilled production staff, comprehensive test and manufacturing capabilities, and a portfolio of world-class product partners, Motion Solutions can tackle almost any project a customer brings us. We can handle clean-sheet design as easily as shipping a part in inventory. We can deliver hundreds of custom subassemblies a month as easily as a single prototype. We didn’t get to this point overnight, however. The Motion Solutions story has been one of evolving to meet changing market conditions while continuing to strengthen the core engineering capabilities that brought us to where we are today. Motion Solutions launched in 1956 as Bearing Engineers Inc., an application consulting firm dedicated to the design and selection of ball bearings for OEM customers and applications. 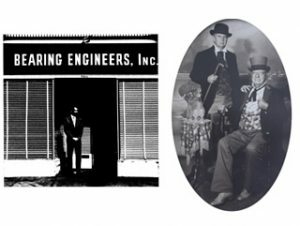 Founders Art Weiss and Bob Bloom built Bearing Engineers on a commitment to application engineering excellence, as well as to assembling a support staff and infrastructure to execute that strategy. Although their consulting was successful, they sought a more consistent business model and broadened out to product distribution. They started out with retaining rings, which led to business relationships with additional manufacturers of bearing-related hardware, such as stamped retaining rings, bearing locknuts, and lock washers, and Belleville springs. When it came time to add a bearing vendor, Bearing Engineers chose a Japanese machine tool manufacturer whose commitment to excellence matched that of their own. The distribution agreement did more than just enable Bearing Engineers to supply quality products to customers. It laid the groundwork for their future partnerships in Asia. In the 1960s, Bearing Engineers scored a significant win when Bob Bloom was instrumental in helping IBM develop the first disc-drive spindles. In addition to securing the bearing business, he was also able to add on Belleville springs, retaining rings, locknuts, and lock washers to enhance the value of the sales. Bearing Engineers established a strong position in this market, not only with IBM, but also most of the other manufacturers to come along through the 1970s. By the early 1980s, disc drives had become commodity items and the market no longer played to the strengths of Bearing Engineers. In response, the company once again sought a new opportunity that would differentiate it from the competition. At this point, direct linear motion was assuming an increased importance. In Japan, this was partly enabled by THK, which had revolutionized linear motion bearing technology with its circular arc groove technology and miniature linear bearings. Over years of doing business in Japan, the Bearing Engineers principals had forged a relationship with the person who became the founder of THK. This led to THK naming Bearing Engineers as its US distributor. The introduction of linear motion bearings to the Bearing Engineers product offering fueled rapid growth during the 1980s, particularly in the semiconductor industry, where the company is still successful today. In the 1990s, linear bearings became more commoditized, with THK and other competitors expanding their own direct domestic presence. Once again Bearing Engineers had to explore new markets and technologies to maintain growth. This time, however, the response ushered in an entirely new way of serving industry. Throughout decades of distributorship, Bearing Engineers had been asked about offerings on “other side of the ball screw”–gear boxes and motors–but the principals thought it wasn’t a good fit. They changed their position in the early 1990s with the hiring of Henry Kim, who was tasked with adding a motion-control segment to the Bearing Engineers portfolio. Although the organization came late to the electromechanical sector, Henry was able to secure marquee product partners such as Kollmorgen, IMS, CGI, and Teknic. These manufacturers still constitute the core of the Motion Solutions motion control products group to this day. By the late 1990s, Bearing Engineers lacked only machine-tool capabilities to provide complete design and prototyping services. At the prompting of a customer, they upgraded their facilities by adding a dedicated machine shop. The value-added contract manufacturing segment of the business was born, beginning the transition to the company we are today. In some ways, moving from distribution to manufacturing was a big shift. In others, it was merely another in the ongoing evolution to deliver more comprehensive engineering solutions to the market. In the 2000s, we greatly expanded both our facilities and our engineering services to better support this growing segment of the business. The global recession pushed many OEMs and end-users to outsource engineering and production. Bearing Engineers was there with a combination of the right offerings at the right time. Investments in people and capabilities such as state-of-the-art coordinate-measuring machines (CMMs), laser interferometers, class-100 clean room manufacturing space, and industry-leading parts cleaning equipment have shown customers our commitment to cutting-edge capabilities. This has equipped us to open new ground in the world of precision and quality. As a result, our value-added engineering segment has flourished. With specialty and volume production facilities, a team that includes design engineers trained by the founders and value pricing on the products we distribute, Bearing Engineers is uniquely positioned for growth in this area. 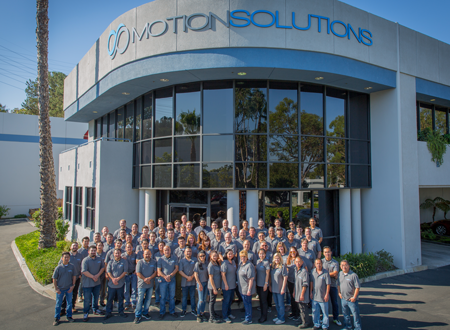 In January 2014, to better showcase our capabilities, we changed our name to Motion Solutions. The name change wasn’t the only advance that year. Recognizing an opportunity to expand our geographic scope, product capabilities, and commitment to operational excellence, Motion Solutions welcomed new investment from partners committed to supporting our significant potential. With deeper resources and expertise, Motion Solutions has made a series of strategic acquisitions designed to equip the company to more comprehensively serve target markets. Specialty Motions Inc. (SMI) based in Corona, California, joined Motion Solutions in August of 2015. SMI is a value-added distributor of linear motion and motion-control solutions for a variety of end markets, including medical device, life sciences, aerospace, and technology. R.M. Hoffman Company became a division of Motion Solutions in September of 2016. Based in Sunnyvale, California, Hoffman is an engineering-services provider as well as a value-added distributor of rotary and linear motion products for a broad customer base in many end markets. The company’s deep domain expertise in rotary motion made it a perfect complement to the linear-motion specialization of Motion Solutions. With nearly 60 years in business, Motion Solutions has a track record of adapting to market and technological change. Even as we engineer project after project for our customers, we engineer our own offerings for success. Through continuous reinvestment in our team, our facilities, and our capabilities, Motion Solutions will continue to position our organization to tackle even the most challenging applications.